My salad days may be in the attic, but a good salad is still a part of every day. 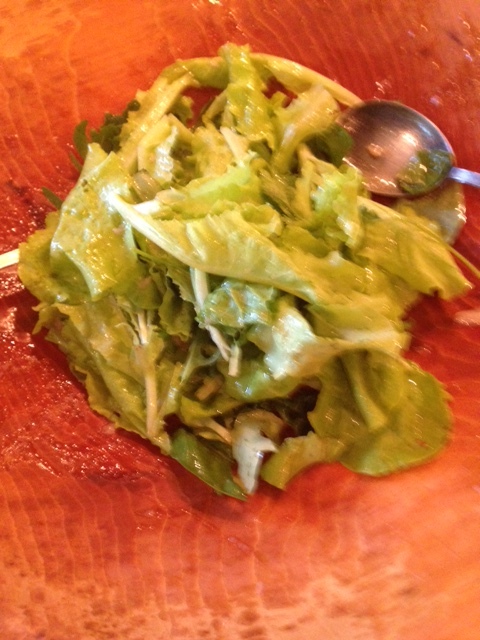 Since the dawn of my cooking life, a routine salad always means soft greens with vinaigrette dressing. I wish I could remember who introduced me to the golden elixir, good olive oil, and its alchemic magic when combined with red wine vinegar. Maybe it was the Greek family that ran the market for the Basque sheepherders, or my distant Italian great aunt, or an ancient issue of Gourmet magazine. That watershed defined salad, removed olive oil from the medicine cabinet and has stayed with me ever since. For me and my children, salad after dinner never means coleslaw or Waldorf, but simply green salad. 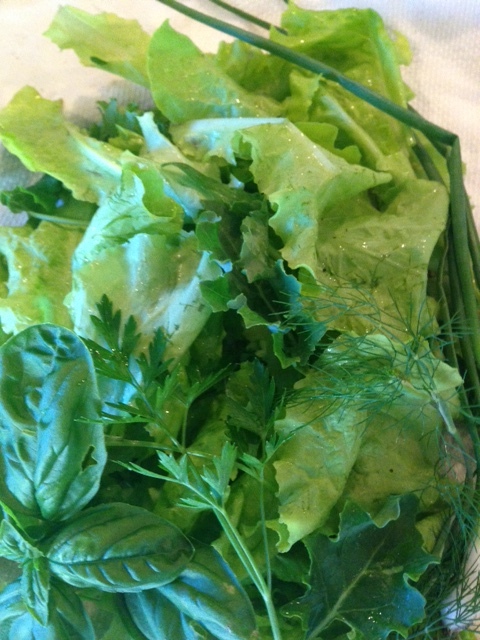 We may add dill, basil, arugula and tarragon as they leaf in the garden or true ripe tomatoes and cucumber in late summer, but nothing satisfies like fresh soft lettuce and vinaigrette dressing. I’ve never been able to understand the popularity of bottled salad dressings. They’re usually composed of compromised ingredients, sold at inflated prices where you’re mainly paying for packaging and advertising. When a salad can be dressed simply with a pinch of salt, a twirl of olive oil and a squeeze of lemon why would anyone go with Kraft? 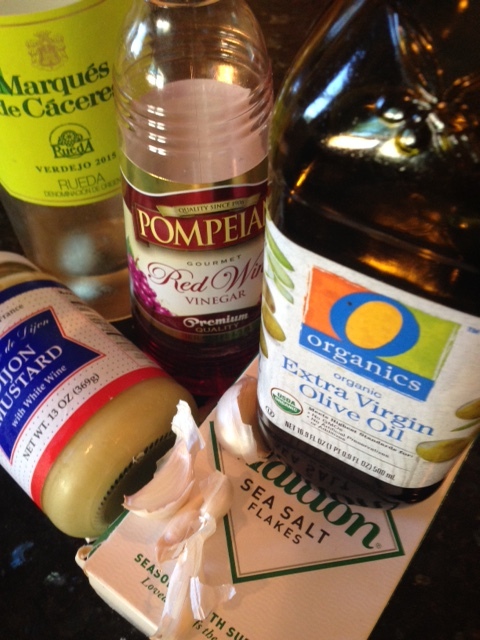 For less than the price of most bottled dressings you can buy excellent olive oil, reasonable vinegar, and sea salt. The additions of wine and Dijon mustard are nice but not essential. It takes no more than two minutes to stir the sauce in the bottom of your salad bowl. Pile on the leaves washed and spun dry, and toss when you’re ready. Not a dressing to make ahead, it’s best when fresh, since good olive oil will solidify when chilled. This salad is light; it’s pure; it’s inexpensive and for us it’s usually dessert. In the bottom of a wide, shallow salad bowl, crush the garlic with salt using the back of a spoon. Add the vinegar, wine, mustard and mix well. 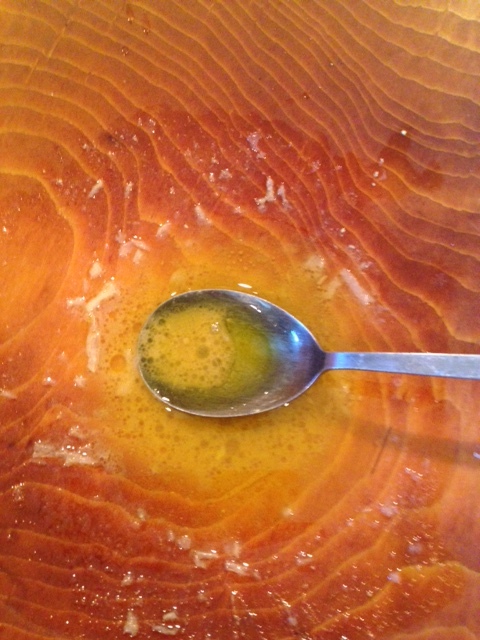 Swirl in the olive oil. (Add a little chopped scallion or a few shaves of red onion and let marinate in the dressing if desired.) Pile washed, dry salad leaves on top and toss in the dressing when ready to serve. For the last choir rehearsal before summer break, it seems like a good idea to take along a plate of cookies. There’s a package of coconut staring at me and walnuts left from winter cakes. I flip to that page in the Joy of Cooking with the old recipe for Angel Slices and see a series of notes. 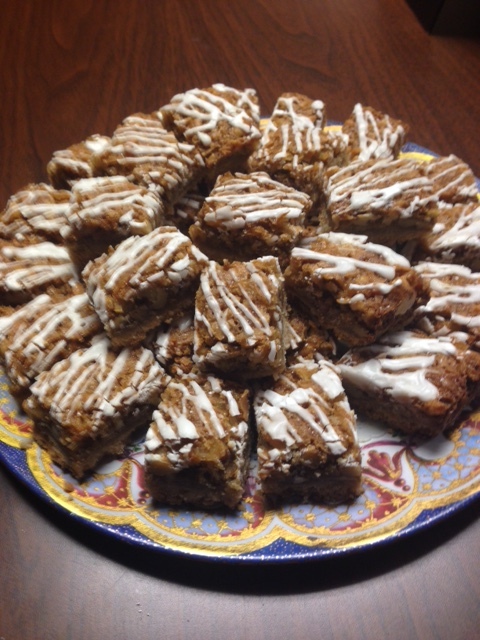 There’s an old file card with a similar recipe from Dorrie Waltz, the walnut shortbreads notes from the shop, and the memory of baking these bars for the nurses at DeKalb County Hospital who gave me so much support following Catherine’s birth decades ago. It’s a great recipe; time to bring it out again. After years of experience, I’ll take the liberty to make a few changes. For the shortbread base, I’ll use my standard 1,2,3 proportions instead of the egg yolk pastry suggested. The basic 1,2,3 shortbread never fails especially when made with European style butter. This is the cookie recipe always to have in your hip pocket memory : 1 oz. sugar, 2 oz. butter, 3 oz. 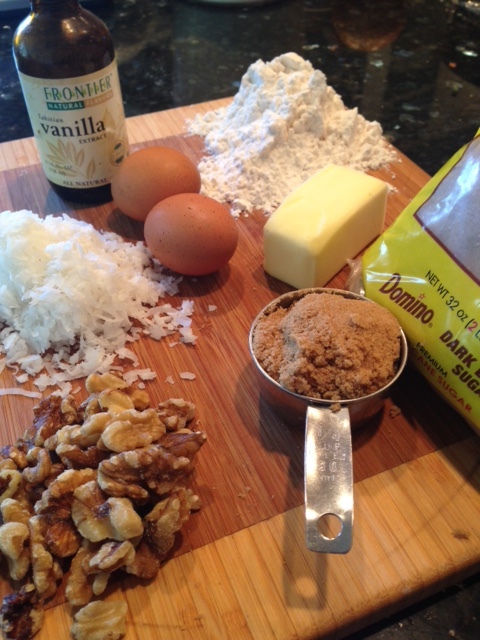 flour; include a pinch of salt with unsalted butter and a quarter teaspoon vanilla for free standing cookies. the syrup and limit the brown sugar in the topping to 1 cup. The lemon glaze drizzle is optional but adds a festive flair if you have time for the fiddly bit. These old fashioned bars always bring a nostalgic swoon, a good choice to say goodbye and thank you. Preheat the oven to 350º. Line an 11 by 7-inch baking tin with parchment for easier removal. Prepare the shortbread base by mixing the softened butter into the 2 oz. brown sugar and 6 oz. flour. Crumble the cookie mixture over the base of the baking tin. Pat the base evenly over the bottom of the tin, smoothing the top with back of a spoon. Bake the base 15-20 minutes or until lightly colored around the edges and the top beginning to lose the “raw” look. Meanwhile combine 7 oz. brown sugar with 2 tablespoons flour, salt, baking powder and whisk in the 2 eggs with vanilla. Mix to insure brown sugar lumps are melted. Add walnuts and coconut. 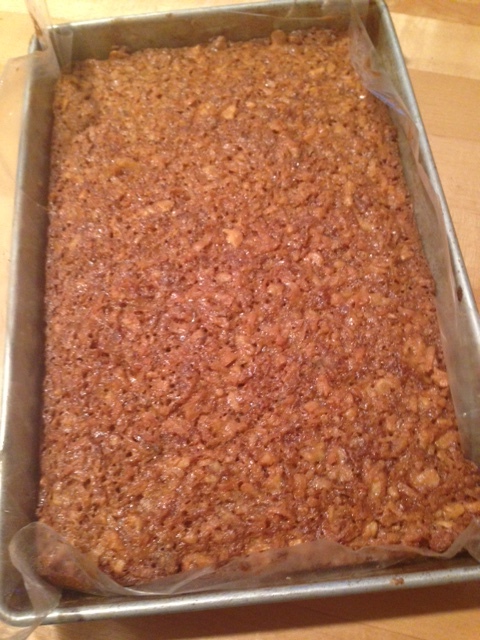 When the shortbread base is ready, dollop the coconut mixture over the top and spread evenly with the back of a spoon. Return the tin to the oven and bake for 25-30 minutes or until golden brown on top. 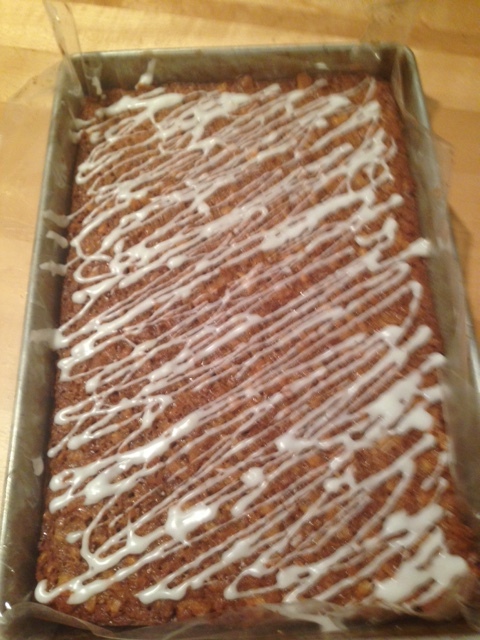 Remove to cooling rack and while still warm decorate with a thin icing made from powdered sugar and lemon juice. Use the tines of a fork or a pastry bag with a writing tip to drizzle the icing. Cool thoroughly until the icing has hardened. Invert the cookie rectangle into a cooling rack, peel off parchment and upend it onto a cutting board. Cut into squares. Makes 36-48 luscious bites. You are currently browsing the Mary Jo's Kitchen blog archives for June, 2017.